Breeding’s old meaning: verb- (of animals) mate and then produce offspring; noun - a stock of animals or plants within a species having a distinctive appearance and typically having been developed by deliberate selection. New breeding techniques (NBTs) are new methods of genetic engineering that give scientists the ability to more precisely genetically modify crops and animals. Using NBTs, researchers can enhance or silence or insert or remove desired traits. Scientists usually move genes from within species (although there are a few transgenic examples of NBTs), bypassing a common argument against first generation genetic engineering (GMOs), which required crossing the “species barrier” through the transfer of genes from bacteria and other plant species. NBTs also allow researchers to more precisely and quickly insert desired traits from within species than traditional breeding, which is one reason why regulators look at them as a faster version of conventional breeding techniques. Due to these differences with GMOs, plants bred with these techniques have so far faced lower regulatory hurdles than “transgenic” products, although the regulatory landscape is unsettled. NBTs occasionally use transgenics and most new products can be developed in a fraction of the time and cost of conventional or transgenic breeding. There is no finite set of NBTs and future techniques may be put under the same umbrella term. There are currently seven broad, scientific categories of NBTs. Most popular in agricultural biotechnology are gene editing—CRISPR systems and TALENs—and other NBTs, including RNA interference (RNAi) and epigenetic techniques and sprays. Read more. Do you know what the eight essential nutrients are for humans? You can read them here. Zinc is high on the list with many functions noted: helps you maintain a sense of smell and have a strong immune system; builds proteins, triggers enzymes, creates DNA, and more. In relation to the previous post, zinc is perhaps the most critical trace mineral for male sexual function. It is involved in virtually every aspect of male reproduction including the hormone metabolism, sperm formation, and sperm motility. As noted in previous posts, biotech is not always highly complex; sometimes it explores and then puts a star on things like zinc or Blackstrap molasses (post 3) or jackfruit (post 11) because they are good for our health. Biotech and its underling (or overlord? ), organic chemistry, can make clear what zinc does for us, how much we need and how a deficiency affects us. It can prove what chemicals will harm soil so that it has no zinc to impart to a crop, preventing zinc intake through foods. Or, biotech can concoct medicines to enhance male function which we hear about continually on radio and TV. But those “little blue pills” (etc) do not contain zinc. In itself, biotech is neither good nor bad. It is a body of knowledge, an exciting field of work, a tool or means in the hands of humans that can work toward good or bad ends. It can explore things found in nature like quinine (post 18) or wormwood (post 24) and discover new ways to heal diseases. Nanotech (post 15) manipulation of zinc led to the discovery of zinc-finger nucleases (ZFNs). These are way above the understanding of laypeople and may be a good example of why we consider biotechnologists to be geniuses capable of doing great good, however they may instead do great evil, in some cases never even knowing the difference. Zinc finger nucleases (ZFNs) are a class of engineered DNA-binding proteins that facilitate genome editing by creating a double-stranded break in DNA at a user-specified location. This reminds us of post 4 where we looked at the potential for genome modification that could change the DNA of a human, altering it in the germ stage, thus reinventing a person who originated with one genome destiny to a new one— one selected by the biotechnologist that will be inherited by the subject’s offspring. Just this past week, news reports heralded that genetic modification of embryos to alter a portion of DNA has been accomplished by a Chinese biotechnician, Dr. He Jiankui. His alteration presumably will prevent HIV/AIDS in twin girls who were born in November 2018. Christians and other moral persons in the biotech field will— and already have— forcefully condemned Dr. Jiankui's “accomplishment,” but continuing manipulations of human life are a foregone conclusion. The 3-parent baby is another example. Exploring all the ramifications of this trend in biotech is a job for the experts. But laypeople must study their discussions and be ready to comment (post 13). One website to visit for bioethical news and discussions is the Markkula Center for Applied Ethics. I hope to add more such resources in the new year. Many, even Christians, will argue that genetic mutations and other aberrations caused by viruses like HIV must be eradicated, and this process must start out in the petri dish. 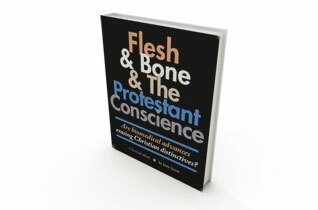 Ten good reasons not to start life in vitro are listed in Flesh & Bone & The Protestant Conscience. I hope to re-add this content to this website and to add more reasons in the new year. At the end of this blog series and at this Christmas Season, it is good to celebrate that Jesus Christ is the champion of good biotechnology. He is the Wonderful Counselor. (Isa 9:6) Look to Him for understanding and wisdom.